Swiss watchmaker Rado specialise in high-tech ceramic watches that are simultaneously durable and beautiful. With timepieces that are meant to last a lifetime and more, Rado have a rich and proud history of innovation that has made them stand out in the watchmaking world. Rado watches lean towards a minimalist aesthetic which, combined with cutting-edge materials technology, will make you think the brand is younger than it is. Since its inception, the ground-breaking watchmaker has captivated watch aficionados worldwide with an innovative spirit, unique aesthetics and technological developments, which have put the brand well ahead of its time. Rado were founded in 1917 by brothers Fritz, Ernst and Werner Schlup. The company’s history began in the small town of Lengnau in Switzerland when the brothers opened Schlup & Co, a clockwork shop. This atelier was created from a converted part of their parents’ home. While the Rado trademark was registered in 1928, for the first decades of operation, the Schlup brothers focused only on producing watch movements. Schlup & Co started selling watches under the Rado brand in the 1950s; in 1957, they became Rado Uhren AG, and the Rado Collection was soon born. By the end of the decade, Rado were already an international brand with a presence in more than 61 countries. The brand may have had humble beginnings but, by the end of the Second World War, the factory was one of the largest producers of watch movements in the world. 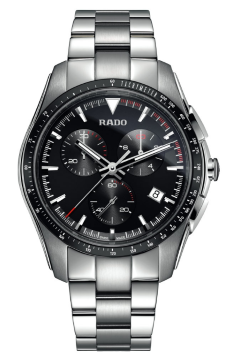 Today, Rado are known for their focus on ceramics, water-resistant technologies and high-tech materials. The Swiss watchmaker has also received several international design awards for their unconventional aesthetics. High-Tech Ceramics – Rado have been experimenting with this material for almost thirty years, and all of the pieces that utilise it are a combination of art and craftsmanship. Their high-tech ceramics are lightweight and hypoallergenic, as well as sturdy and durable. Comfortable for everyone, even people with sensitive skin can wear this signature material. 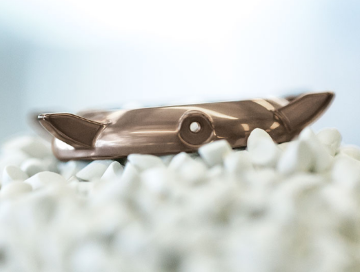 CeramosTM – A material that is lightweight, hard and innovative, CeramosTM is a unique alloy of high-tech ceramic metal that offers the best of both worlds: the lightness and sturdiness of ceramic with the lustre of metal. High-Tech Diamond – After years of research and the use of cutting-edge nanotechnology, Rado released the V10K watch, which is made from a material as hard as natural diamond. This high-tech diamond surface allows the watch to achieve a hardness of 10,000 Vickers. These are just some of the materials Rado are known for developing and working with, but their spirit of innovation drives them to continue creating increasingly innovative, sleek and robust materials. 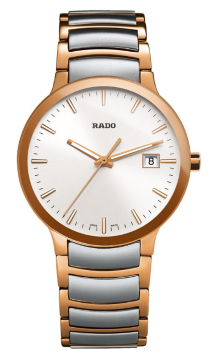 Rado’s innovative use of state-of-the-art materials allows them to stand out from other Swiss brands. By the 1960s, they were already using uncommon materials, such as carbide and sapphire glass, in their timepieces, and today they continue to focus on light, sturdy and scratch-resistant materials. The watchmaker has used ceramic since 1986, due to the versatility and strength of the material, adding it to almost every Rado timepiece. The brand’s sleek designs and elegant minimalism gives each watch a unique aesthetic. Rado’s watch catalogue is extensive and ranges from dress watches and retro pieces to skeleton models and chronographs. All pieces are powered by mechanical automatic movements or quartz movements. This use of unique, one-of-a-kind materials on two of the brand’s most popular ranges, the HyperChrome and the Centrix collection, elevates them to new heights and have given Rado the title “The Master of Materials”. Perhaps the most comprehensive and diverse range, the HyperChrome family is the epitome of sporty-chic with over 70 models. Versatile and inspired by vintage Rado watches, this range offers both quartz and automatic movements, and also gives you the choice between a large variety of colours, sizes, styles and materials. The Rado HyperChrome collection offers sophisticated pieces that are perfect for everyday wear, as well as for special occasions. The Hyperchrome Chronograph 44.9mm watch is a spectacular example of the innovation and excellence Rado are known for. Dynamic, sleek and sporty, this chronograph will look just as good in a business suit as it does with a casual outfit. This model for gents seamlessly blends style with performance to create a true watchmaking masterpiece. The stainless-steel case and the sapphire crystal material ensure this watch is scratch-resistant and durable, and the contrast between the stainless-steel strap and the black dial adds a touch of elegance to an already-stylish piece. The Rado Centrix collection is incredibly versatile. With different sizes and colour combinations to choose from, you are sure to find a watch that will suit your tastes. The state-of-the-art sapphire crystal and the high-tech ceramic with stainless steel guarantee that every piece in the collection will last a generation. The Centrix range is suited for everyone seeking modern luxury without compromising comfort; the high-tech, scratch-resistant materials make each watch a lightweight wonder that is a true pleasure to wear. The Rado Centrix 38mm watch is one such piece in the collection. This unisex model comes with the signature Rado sapphire crystal that makes it durable and scratch-resistant, as well as a steel and PVD bracelet and case. The piece also comes with water-resistance of up to 30 metres and quartz movement. Rado watches showcase pure Swiss craftsmanship and luxury at affordable prices. We’re proud to stock a vast selection of Rado watches you can explore here at Banks Lyon, from the True range to the Integral collection. To this day, this globally recognised brand continues its visionary use of cutting-edge materials and unique styles, ensuring each piece blends performance with durability and comfort. Most Rado watches display a minimalist style that is truly iconic; an understated elegance that is, nonetheless, stunning and eye-catching at the same time. Visit our Lancaster and Kendal stores to see the beautiful Rado timepieces for yourself or browse any of our other world-renowned brands.